Everyone dreams of finding their perfect match, and at NoveList we strive to help you find that perfect match for your readers. But we aren’t talking about any love connections here -- these are book connections we call read-alikes. Like you, we’re passionate about pairing readers with books they will love. We also know it can be hard to get the word out about your awesome readers’ advisory services, so we created these NoveList promotional pieces for our LibraryAware customers. (Not a LibraryAware customer? Watch a quick demo to learn more). Made with every reader in mind, these new designs include templates for flyers, bookmarks, and email blasts and are easy to edit based on your library’s (and your readers’) preferences. These easy-to-use templates are designed to make readers’ advisory less daunting for you and to help your readers explore all the reading options available at their beloved public library. Are your readers interested in sci-fi mystery books or Australian romantic comedy? Help your readers understand that their library lets them read their way, with genre, themes, and appeal combinations that create unique book suggestions to perfectly match their interests. And the secret’s out about how you give these spot-on book recommendations. The templates will make it easy for you to let them know about their free access to NoveList, a bibliophile’s paradise. Customization is simple. 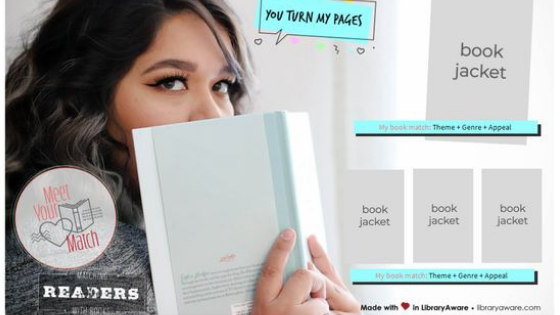 After you’ve searched for books in NoveList using our theme, appeal, and genre terms, pop the covers into these templates, letting your readers know you’ve got a book for that. Your readers don’t have to settle for just any book, especially when NoveList and LibraryAware can help them find their true match. Love the templates, but don’t have LibraryAware? Ask for a demo today.